People living in volcanic areas may be at a higher risk for thyroid cancer, according to a new study published online November 5 in the Journal of the National Cancer Institute. The increasing incidence of thyroid cancer has been attributed to more sensitive screening, but recent evidence indicates that this may not be the only cause. 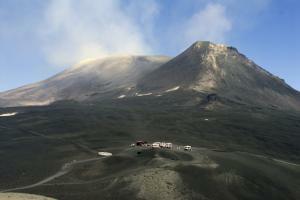 Various environmental factors, such as those associated with volcanoes, have not been excluded as risk factors. To study this, Gabriella Pellegriti, M.D., Ph.D., of the endocrinology division, University of Catania Medical School, Garibaldi-Nesima Hospital in Italy, and colleagues collected incidence [newly diagnosed cases] of thyroid cancers in Sicily from January 1, 2002 through December 31, 2004 to compare the cancer rates of residents living in the volcanic area of Mt. Etna of Catania with those in the rest of Sicily. The researchers found that residents of the Catania province had a more than two times higher incidence of papillary thyroid cancer, but not follicular or medullary thyroid cancers, than elsewhere on the island. Also, papillary tumors from patients in Catania more frequently carried the BRAF V600E gene mutation, which has been associated with more aggressive thyroid cancer. The authors point out that a volcanic environment -- which can produce toxic compounds that are suspended particulate matter and gases and elements that may pollute the water -- may increase the incidence of thyroid cancer; however, the mechanism by which it affects risk is unknown. "The striking increase in papillary thyroid cancer incidence that was associated with the Etna volcanic environment leads us to suggest that residents of other volcanic areas…could be at increased risk for thyroid cancer and, possibly, of other cancers," the authors write. "Although specific risk factors for thyroid cancer in this volcanic environment are still unknown, identification of these factors could help to better understand the cause(s) of the increasing thyroid cancer incidence in Europe and North America and perhaps to develop prevention measures."